Alfreton Town boss Billy Heath said the Reds had only themselves to blame after squandering a lead to lose 3-2 for the second successive week. 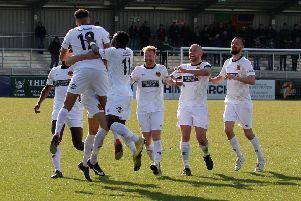 Reece Styche scored a terrific seventh minute goal against Curzon Ashton but was then sent off 11 minutes later for abusive language after contesting an offside decision. “We’ve got to stop giving people the opportunity to damage us and cause us problems. With the score at 1-0 the game was held up for half an hour after a referee’s assistant was injured — with Alfreton kit manager Pam Leaning, a qualified referee, eventually stepping in. Six minutes later it was 2-0 when a swift counter-attack found Bobby Johnson playing a neat one-two with Wilde before the latter scored from 12 yards with a cool finish. At half-time the Reds looked comfortable, but three minutes and 11 seconds into the second half it was 2-2 as Lewis Reilly converted one cross before Martin Riley inadvertently guided another past his own keeper. John McAtee headed an 82nd minute winner before Reds keeper Sam Ramsbottom conceded and saved a penalty.